British supercar maker Aston Martin is going public. Here's why investors should take note. It's on like Bond: British supercar maker Aston Martin is going public. James Bond's favorite carmaker, properly known as Aston Martin Lagonda Global Holding plc, confirmed on Monday that it will seek to list its shares on the London Stock Exchange within weeks, likely in October. Shares of Aston Martin's old rival Ferrari (NYSE:RACE) have more than doubled since the Italian icon's public offering in late 2015. Will Aston's shares prove similarly profitable? Aston Martin's products combine hand-finished luxury with high performance. Image source: Aston Martin Lagonda. First, an important note: For now at least, Aston Martin has chosen not to register its shares in the United States. That means that aside from certain institutional buyers, U.S. investors will not be able to participate in the Aston Martin IPO. That's disappointing. But we're going to take a look anyway, because it's likely that shares will be available to U.S. investors via the secondary market at some point -- and because the company could be an intriguing investment, for reasons we'll get to below. By way of background, right now, Aston Martin's principal owners are an Italian private-equity fund, Investindustrial; a consortium led by Kuwaiti private-equity firm The Investment Dar (TID); and German automaker Daimler AG (NASDAQOTH:DDAIF), which owns a stake of about 4.9%. Several other private-equity firms hold smaller stakes. What's happening here is that some of the private-equity groups are selling all or part of their stakes via this public offering. Aston Martin itself isn't raising any money via this stock sale. Specifically, the sellers are Investindustrial, which will continue to have a stake; Adeem Investment Company, part of the Kuwaiti consortium; and Primewagon, a London-based private-equity group. How much are they selling? It's not yet clear, though Aston Martin said that at least 25% of its issued shares will float. We'll have more details when Aston Martin releases a prospectus for the offering, which it has promised to do "on or around" Sept. 20. First, Daimler is not selling. In fact, Aston Martin said that Daimler has agreed to convert its stake to the new "ordinary shares" (the British term for common stock) and to hold it for at least 12 months after the IPO. Second, chairing Aston Martin's post-IPO board of directors will be Penny Hughes, a longtime Coca-Cola executive who has served on a number of boards, including those of The Royal Bank of Scotland and Reuters. Hughes will be a "non-executive" chair; Aston's well-regarded CEO, Andy Palmer, will continue to run the company (and will be a board member). CEO Andy Palmer has returned Aston Martin to profitability and put it on a growth path. Image source: Aston Martin Lagonda. 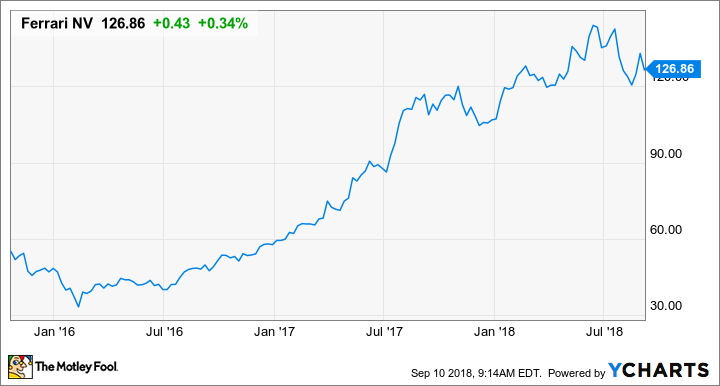 As you can see, shares of Ferrari have done very well since the company was spun off by Fiat Chrysler Automobiles in late 2015, thanks to the company's stratospheric profit margins and a credible profit-growth plan outlined by Ferrari's late CEO, Sergio Marchionne. Ferrari is probably the closest comp for a public Aston Martin, and I think it's very likely that its success as a public company influenced Aston Martin's decision to go public. But will Aston Martin's stock follow the path set by Ferrari? It's hard to say right now, not least because we don't know the IPO price. But we do know that Palmer has a growth plan for Aston that includes several new models and a relaunch of the old Lagonda luxury-car brand as a high-end maker of exclusively electric vehicles. Ferrari's luxury-level margins are a big part of why its stock trades at a fat 35 times earnings. A key goal of Palmer's plan is to boost Aston Martin's adjusted EBITDA and operating margins to Ferrari-like levels in the "medium term" while boosting total sales from 5,117 in 2017 to over 9,600 in 2020. If he can pull that off, then Aston Martin's shares might well deserve a Ferrari-like valuation. We'll know more when the company releases its prospectus later this month.